I know that one of the most oft-repeated questions I have dealt with is, “How does one explain, or even understand, the doctrine of the Trinity?” Indeed, few topics are made such a football by various groups that, normally, claim to be the “only” real religion, and who prey upon Christians as “convert fodder.” Be that as it may, when the Christian is faced with a question regarding the Trinity, how might it best be explained? For me, I know that simplifying the doctrine to its most basic elements has been very important and very useful. When we reduce the discussion to the three clear Biblical teachings that underlie the Trinity, we can move our discussion from the abstract to the concrete Biblical data, and can help those involved in false religions to recognize which of the Biblical teachings it is denying. We must first remember that very few have a good idea of what the Trinity is in the first place – hence, accuracy in definition will be very important. The doctrine of the Trinity is simply that there is one eternal being of God – indivisible, infinite. This one being of God is shared by three co-equal, co-eternal persons, the Father, the Son, and the Spirit. It is necessary here to distinguish between the terms “being” and “person.” It would be a contradiction, obviously, to say that there are three beings within one being, or three persons within one person. So what is the difference? We clearly recognize the difference between being and person every day. We recognize what something is, yet we also recognize individuals within a classification. For example, we speak of the “being” of man—human being. A rock has “being”—the being of a rock, as does a cat, a dog, etc. Yet, we also know that there are personal attributes as well. That is, we recognize both “what” and “who” when we talk about a person. The Bible tells us there are three classifications of personal beings—God, man, and angels. What is personality? The ability to have emotion, will, to express oneself. Rocks cannot speak. Cats cannot think of themselves over against others, and, say, work for the common good of “cat kind.” Hence, we are saying that there is one eternal, infinite being of God, shared fully and completely by three persons, Father, Son and Spirit. One what, three who’s. NOTE: We are not saying that the Father is the Son, or the Son the Spirit, or the Spirit the Father. It is very common for people to misunderstand the doctrine as to mean that we are saying Jesus is the Father. The doctrine of the Trinity does not in any way say this! 1) There is one and only one God, eternal, immutable. 2) There are three eternal Persons described in Scripture – the Father, the Son, and the Spirit. These Persons are never identified with one another – that is, they are carefully differentiated as Persons. 3) The Father, the Son, and the Spirit, are identified as being fully deity—that is, the Bible teaches the Deity of Christ and the Deity of the Holy Spirit. The three sides of the triangle represent the three Biblical doctrines, as labeled. When one denies any of these three teachings, the other two sides point to the result. Hence, if one denies that there are Three Persons, one is left with the two sides of Full Equality and One God, resulting in the “Oneness” teaching of the United Pentecostal Church and others. 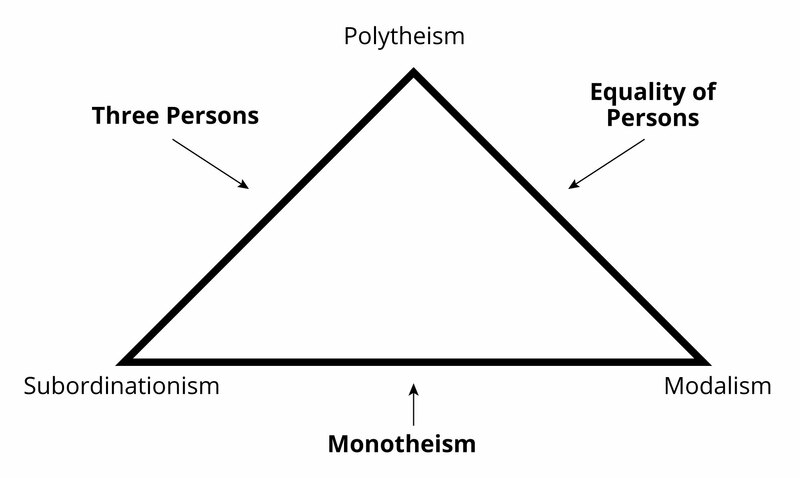 If one denies Fully Equality, one is left with Three Persons and One God, resulting in “subordinationism” as seen in Jehovah’s Witnesses, the Way International, etc. (though to be perfectly accurate the Witnesses deny all three of the sides in some way—they deny Full Equality (i.e., Jesus is Michael the Archangel), Three Persons (the Holy Spirit is an impersonal, active “force” like electricity) and One God (they say Jesus is “a god”—a lesser divinity than Yahweh; hence they are in reality not monotheists but henotheists). And, if one denies One God, one is left with polytheism, the belief in many gods, as seen clearly in the Mormon Church, the most polytheistic religion I have encountered.